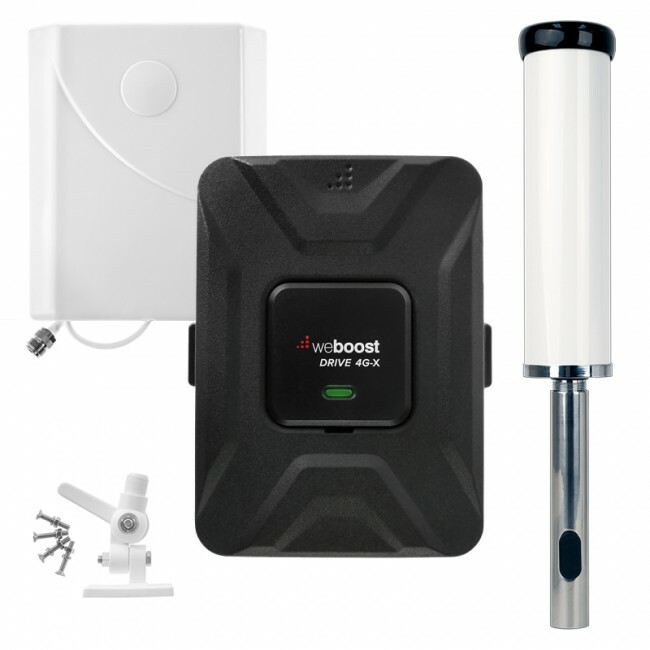 When installing a cell phone signal booster in your home, office, or vehicle, you want to make sure to get every extra ounce of boosting power out of it that you can. We want you to be using your signal booster in the most effective and efficient way possible, so we've compiled a list of things that you can do today to get the most boosting power for your money. The one thing that we see confuse people more than anything else is the difference between the different networks on each carrier. Signal boosters will only work for the carriers and networks that they're intended for, so it's important that you're looking at the same network on your phone that your signal booster is supposed to be boosting. One example which trips up a lot of people is the 4G network that they see on AT&T, which actually runs over the 3G frequency. The newest 4G network is depicted as 4G LTE on AT&T phones, and runs over a completely different frequency than AT&T 3G and 4G. Signal boosters which boost 3G signal will improve the signal for a phone on AT&T 4G, but will not improve the signal for a phone on AT&T 4G LTE, since it's a different frequency. Thus, if you're trying to improve the effectiveness of your 3G signal booster, and you're on 4G LTE, you won't see any change in signal strength. You'll need to disable 4G LTE, which will then fall back to to the 3G frequency, and you'll be able to see the improved signal. This also applies if you have a 4G LTE only signal booster, and your phone is showing that you're on the AT&T 4G network. You won't see any change in signal, since those are two different frequencies. Once you're sure the network your phone is on matches the network that you're trying to boost, then you can go ahead with improving the effectiveness of your signal booster. Always use the shortest cable lengths possible. The longer the cable, the more signal loss there will be. If your cable is too long, then choose a shorter length cable rather than rolling it up, which can cause interference and signal loss. Always use the best cable possible. If your kit comes with RG-59-Mini Cable, upgrade to RG-6 cable. If your kit comes with RG-58 cable, upgrade to LMR-400. Make sure there is enough separation between antennas. Having the antennas too close together will cause your signal booster to automatically reduce its power and effectiveness. If you can't increase the distance between antennas, try shielding one from the other, as mentioned in our article about "How to Prevent Oscillation". Omnidirectional antennas are easier to install, but are generally far less powerful than directional antennas. We only recommend omnidirectional antennas in cases where the outside signal strength is very good and you need to cover multiple carriers at the same time. If your outside signal strength is less than 4 bars and you DO NOT need to cover multiple carriers, we recommend upgrading to a directional antenna. If you’re not sure what directional antenna would work best for your system, feel free to contact us. If your outside signal strength is less than 4 bars and you DO need to cover multiple carriers, you’ll need to determine if the carriers' towers are in the same general direction, in which case you can use a single directional antenna. If the towers are in multiple directions, you may be able to use multiple directional antennas or you could upgrade to a higher-gain omnidirectional antenna. Contact us for help figuring out which is best for your situation. Directional antennas are more powerful than omnidirectional, however they do need to be aimed in the direction of the carrier’s tower. Carriers can add new towers and decommission old ones at any time, so if you notice that your signal is no longer as strong as it used to be, you should go through the aiming process again to ensure that the outside antenna is pointed in the best possible direction to maximize boosting power. In some situations, everything may be working correctly, but you have one room that's too far from the internal antenna and is not receiving adequate coverage. In this situation, your best solution is to add another internal antenna to cover the additional space. By splitting the signal in two, you can cover spaces with shapes more complex than a square or rectangle. 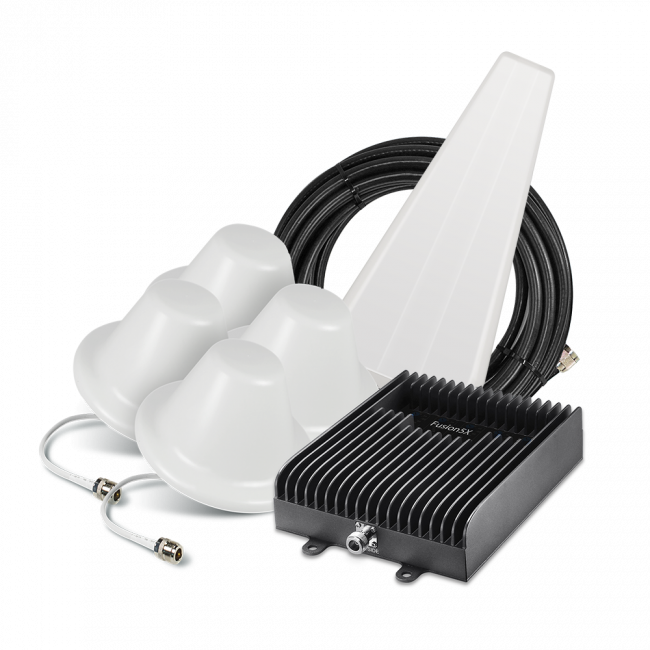 UberSignal offers two different add-on kits specifically for this situation, one is the antenna add-on kit for 75 ohm signal boosters and the other is the antenna add-on kit for 50 ohm signal boosters. Please contact us if you have any questions about which antenna add-on kit will work best for your situation. Sometimes there are situations where you have no choice but to use a significantly long cable or multiple inside antennas for your signal booster system, and you need additional power to cover the intended area. 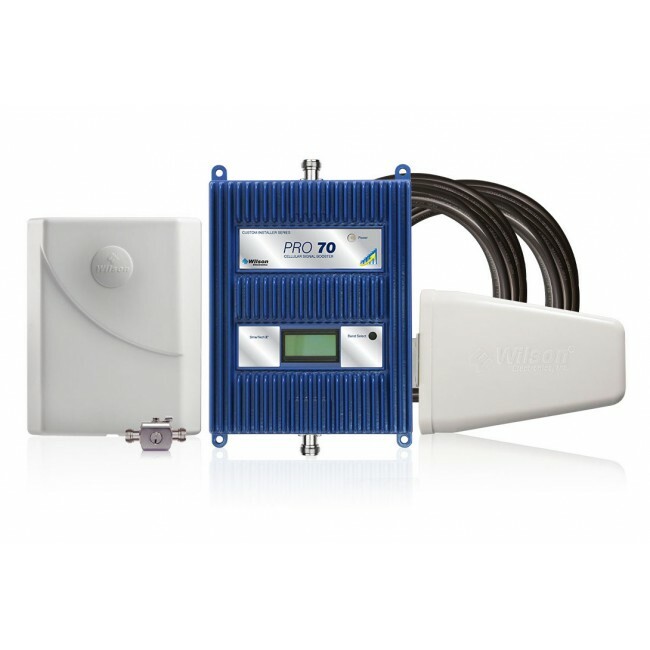 For these sorts of situations, we offer in-line signal boosters that are designed to boost the signal that is lost from long cables or the use of splitters. In-line boosters allow you the flexibility to increase the power of the entire system, or just one needed element, like an antenna, depending on their placement. UberSignal offers both 50 ohm in-line signal boosters and 75 ohm in-line signal boosters, which should handle most situations that you'll encounter. For assistance determining whether your situation could be improved with an in-line booster, or for help choosing the right booster, please contact us. As you can see, there are many ways to increase the effectiveness of a cell phone signal booster system. If after all of this, your signal booster still isn’t performing as well as you’d like, give us a call and we'll be happy to help you diagnose the problem and improve its boosting ability! I have a Wilson DB Pro and have 100 foot Wilson 400 cable. I get service from a tower in Marathon, Texas about 50 miles to the northeast of me. There is a mesa on the line of sight. I have a 20 foot tower with a omnidirectional antenna. I do get cell phone service, but it's not all that great. I'd like to do a little better. I need to move my antenna more easterly. Now, did you imply in your response to Dave that you could put an inline amplifier in and cable in more than 100 feet? Can I use two 100 foot lengths of Wilson 400 (or equivalent) without an inline amplifier? Opinions about this stuff is all over the place. 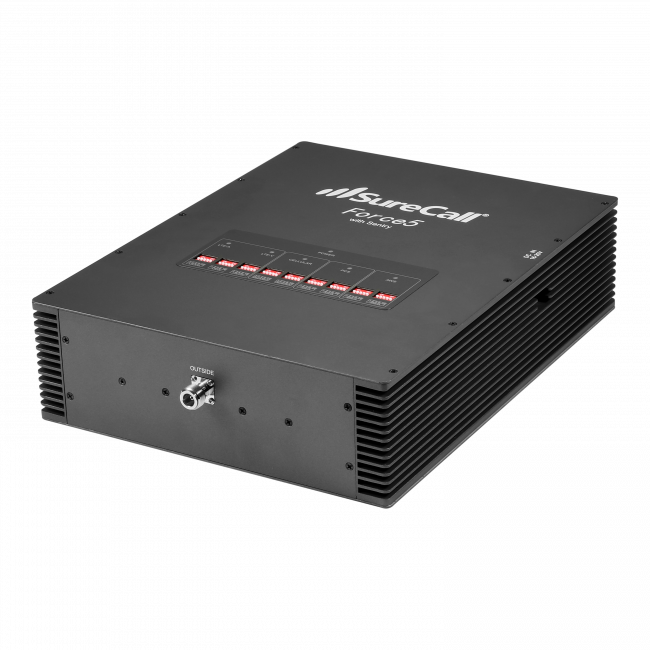 We used to have in-line amplifiers as an option, but with the new set of FCC regulations that went into force on May 1st of this year, we no longer have those as an option unfortunately. The first thing I would recommend is changing from an omni to a directional outside antenna. Even without perfect line-of-sight, a directional antenna will generally outperform an omni antenna. I definitely would not recommend going any longer on the outside antenna cables. With 100 ft. of LMR400, you lose about 7 dB at 1900 MHz, so in order for it to make sense to add more cable, you would need to gain at least 7 dB in existing signal strength in the new location just to break even. So to recap, no inline amps anymore, directional instead of omni antenna is likely going to be best bet, and we don't recommend a longer outside antenna cable unless the existing signal is significantly (> 12 to 15 dB) better. I hope that helps.